Scenic boat tours aboard classic wooden boats on the pristine lakes of Glacier National Park. Skilled and friendly crew provide a commentary on all of our lake cruises. Four locations: Lake McDonald, Many Glacier, St. Mary Lake, and Two Medicine. Many Glacier: Enjoy unique, awe inspiring views. Several of the Park's larger glaciers can be seen from Many Glacier boat tour. Cross Swiftcurrent Lake, take a short 2/10 mile walk, then board another boat to the head of Lake Josephine. Boat schedule accommodates hiking and picnicking in back country. When the trail to Grinnell Glacier opens, an 8:30am cruise is added for hikers to Grinnell Glacier. Guided walks also available to Grinnell Lake on 9:00am and 2:00pm cruises. Check at boat dock or National Park Service station for early and late season guided hikes. Rental boats without motors available. Lake McDonald: Departing from Lake McDonald Lodge boat dock at the north end of the Lake, our tours cross to the west shore to view more remote areas. The popular evening cruise offers passengers a way to relax at the end of the day. Rental boats available, with or without motors. Ranger Naturalist on board at 1:30pm and 3:00pm. For late season schedule, check at departure location. St. Mary Lake at Rising Sun: Offering some of the finest views in Glacier Park, St. Mary Lake boat tours feature views of Sexton Glacier, waterfalls, rugged cliffs and primitive forest. Passengers on the 10:00am and 2:00pm can enjoy an optional 2-hour walk to St. Mary Falls with a guide and a return on a later boat. Optional 15-minute walks to Baring Falls are offered on all but the evening 6:30 cruise. No small boat rentals on St. Mary Lake. For early and late season schedule and guided hikes, check at departures location or National Park Services ranger stations. Two Medicine: Two Medicine area boat tours offer back country experiences without back country effort. On 1:00pm and 3:00pm cruises you may join a guide for the optional .9-mile walk to Twin Falls. Rental boats and canoes available, with or without motors. For early and late season schedule and guided hikes, check at departure location or National Park Service ranger stations. 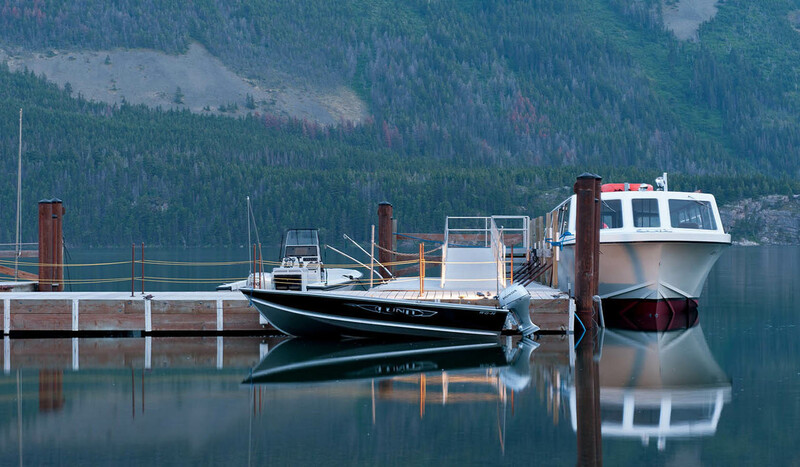 Glacier Park Boat Company operates out of 5 locations within Glacier National Park. On the West side you will find Lake McDonald boat tours departing form Lake McDonald Lodge area and rental boats are available at Apgar Village area, south end of Lake McDonald. On the East side of Glacier National Park, boat tours depart from the Many Glacier Hotel, Two Medicine Valley and halfway down St. Mary Lake at Rising Sun Boat Dock.